You are here: Home › Who Are You? › Who are you? 2018-2019 › ‘4,000 Sunderland fans, midweek game says it all’. Doncaster Rovers Who are You? Salut! Sunderland: you’ve made an excellent start to the season. Good enough to suggest to you that a return to the Championship looms? Darren Burke: belief has rocketed very quickly under Grant McCann, even though his arrival was met with little fanfare. Many thought we’d struggle but the signs so far have been very promising. Fast flowing, attacking football with edge. There’s no reason why Rovers can’t be in play-off contention at the very least at the end of the season. The progress has been made under new managaer, Grant McCann, appointed in June . Your assessment of him and how far he and the present owners can take you? I’ll admit I was one of the Grant who? brigade when he was first unveiled, but I’m enjoying watching Rovers again this season. The football under Darren Ferguson was at times pretty turgid and negative. McCann has certainly injected a spark back into the club. I like him – he’s young and ambitious and obviously keen to deliver. I think the fact he’d done so much homework on the club before he was given the job impressed the owners and I think they are confident they have found their man. We’ve had to get used to some unfamiliar names at this level – and I include many in our our own squad – but who in Donny’s team is catching the eye? Top scorer John Marquis recently reached the notable achievement of 50 goals in 100 games for the club and he’s always a danger upfront. Mallik Wilks, a Leeds loanee, is also dangerous and then there’s James Coppinger – more than 500 games for the club since 2004, 37 years old and came up with a hat-trick of assists against Rochdale. Absolute club legend. What have been the highs for you as a supporter (the promotions of recent seasons must figure among them)? After many lean decades, the last 15 years or so have packed in most of the highs. There’s been plenty to choose from – beating Leeds in the play-off final at Wembley, a Johnstone Paints Trophy win at the Millennium Stadium in Cardiff and winning the League One title with the last kick of the season in an absolute nailbiting finale at Brentford (Google it!). Oh, and going to the brink of the Carling Cup semi-finals, putting out Manchester City, Aston Villa and nearly Arsenal along the way was impressive too. Personally, it will never get any lower than the horrendous 1997-98 season when Rovers went out of the Football League under the crooked and corrupt former benefactor Ken Richardson who was jailed for his part in trying to burn the club down and is widely reviled as the most despised figure ever attached to the club. Some of the stuff that happened that season was just surreal, sad and truly shocking. Even now, 20 years on, I can still recall the only four games we won all season – Chester, Hull, Shrewsbury and Peterborough! Who are the best players you have seen in your colours or wish you were old enough to have seen (I noticed Harry Gregg among past notables)? The aforementioned Coppinger has been involved in much of the delight of recent years, so its hard not to look past him from the current crop. El Hadji Diouf is possibly one of the biggest names in world football who’s pulled on the red and white, although he came during a controversial “experiment” season when out of contract big name players put themselves in the shop window. It didn’t work and we were relegated from the Championship. Alick Jeffrey is generally regarded as the club’s greatest ever player and if it weren’t for injury, he was tipped for the very top. People who saw him play still get misty eyed at his greatness and when he died his funeral was held at the old Belle Vue stadium. Charlie Williams, the comedian and Golden Shot host also played for the club in the 50s – and there’s now a car park named after him as a Rovers cult hero. And who should have been allowed nowhere near the Keepmoat or Belle Vue? Not players, but the previously mentioned Richardson and his odious sidekick “general manager” Mark Weaver still generate anger in the town to this day with mention of their names. Players associated with that era are generally looked on with disdain too. You know you’ve got problems when your chief striker is called Prince Moncrieffe. How strong is Donny’s place within the community in Doncaster given the modern temptations, especially for younger people, to indulge in glory seeking and “support” teams with nothing to do with where they’re from? Rovers have always prided themselves on being a family club but of course, there’s always the temptation to be drawn to the bigger local clubs. Things aren’t as bad as when I was growing up when you would never see anyone (especially kids) sporting the shirt. Nowadays, you’ll see a lot more younger supporters at games so there’s a solid basis for the future. And what is your opinion on the Meet the Owners events your club runs – do you go to them? I’ve never been to one, but by all accounts, they are well attended and popular and the owners don’t shy away from awkward questions. Like all clubs, dissatisfaction tends to go hand in hand with results on the field so when things are going OK, people seem happy to let the board get on with it. Any update on the Belles, effectively forced – like Sunderland Ladies – out of top-level women’s football despite a proud history? The Belles were the original greats of the women’s game and its disgraceful what’s happened to them. They were the undisputed leaders back in the 80s and 90s but as usual, money and big names talk. Hopefully they’ll battle their way back to the top but it is going to take a lot to see them competing at the same level as they used to. What did you make of Sunderland’s sharp decline? It’s sad. I’ve a colleague who supports Sunderland so was kept informed with the goings on at the SOL. Many Rovers fans will tell you that climbing back up through the leagues and visiting new, weird and wonderful places can be a happy experience too – lots of Rovers supporters look back on the days in the Conference with trips to places like Leek, Dover and Kingstonian with a lot of fondness. Other thoughts on SAFC – the club, the fans, the city and region, Jack Ross? It can be hard when you are a big club in a league of “smaller” towns and teams – you’re the one who everyone wants to beat. As long as Sunderland accept their current placing with good grace (Leeds never did when they were in League One!) they have got more chance of a quick return. 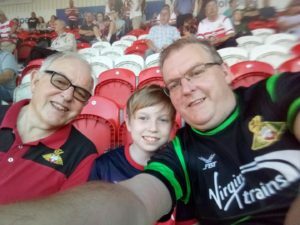 The fans have that whole North East fervour going on – it isn’t very often we see the away end at the Keepmoat full and 4,000 tickets sold out for a midweek match weeks in advance says it all. I’m looking forward to the return at the SOL – will be my first visit. The clubs have only met three times in their entire histories. I’ve got a personal history with Middlesbrough which is a long story for another day! I haven’t spotted too many names associated with both clubs. Sean Thornton is one, Chris Brown another and I am old enough to remember Brian Usher . You also had the admirable Stan Anderson and less admirable Lawrie McMenemy as managers. Do you have memories or strong views on any of them? Chris Brown enjoyed two very successful spells at the club and is warmly remembered. Thornton will always be remembered for an absolute screamer in the 3-0 Carling Cup win against Villa. Stan Anderson was before my time and I think his efforts were very much overshadowed by Billy Bremner who was next into the hotseat and led us to success in the early 80s. It was sad to hear of Stan’s death earlier this year. 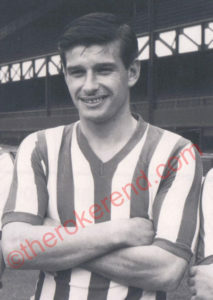 Again, McMenemy was before my time but won the Fourth Division with Rovers in 1968-69. Former Sunderland player Martin Woods also had a decent spell at Doncaster – although its likely Black Cats fans might remember him for his appearance in an off the field video rather than on it! I think that on early showings, both clubs have the potential to be in the mix for the playoffs at the very least. But there’s also no reason why automatic promotion should be out of the question. Rovers ended the unbeaten records of both Portsmouth and Peterborough and totally outplayed the latter on their home patch, so there’s nothing to fear. I can see Rovers and Sunderland scrapping it out and exchanging places all season. Your view on the standard of refereeing in League One? Last season, Darren Ferguson provoked some controversy when he suggested refs should be shot. Fans were largely in agreement with him though. It goes without saying that there’s been some horrendous decisions but I am a big believer that it all tends to level out over the course of a season. One step the football authorities should take to improve fans’ experience of matchdays? The cost of football is still something that needs looking at. Anyone who’s ever been on an away day will know just how much cash you can get through on stuff like tickets, programmes, pies, parking and drinks. On a local level, I wish they’d sort out the parking and the time it takes to get away from the Keepmoat after a game! The Neymar question. Is cheating, in its various forms, here to stay or can VAR help eliminate it? There will always be cheating in football – and let’s be honest, if our team benefits from it, who are we to grumble? The same fans cheering one week watching their team shield the ball in the corner to run down time are the same ones next week booing when the opposition does the same. It’s not to say I condone cheating and underhand tactics, but they’ll always happen and VAR at the World Cup seemed to have the bizarre affect of players pushing their hand even more on what they could get away with. Will you be at our match? What will be the score? I will be – tickets purchased and I’ll be in the South Stand (opposite the Sunderland fans) with my dad and my eldest son, 14. I’ll sit firmly on the fence and go for 1-1 – which is actually quite a low scoring game for us this season. Darren Burke on himself: I’m a dad of two, both boys, 14 and 12, who have also become Rovers fans. I first went to a game in 1981 and started attending regularly in 1987. 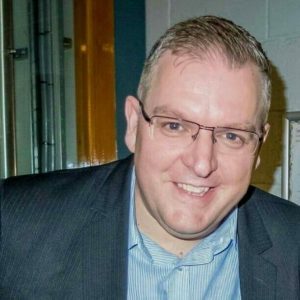 I’m 45 and I’ve been a newspaper journalist for the Doncaster Free Press and Sheffield Star since 1992. I’ve gone all the way to Barrow for a pre-season friendly and got my first tattoo at the age of 35 with a Rovers crest on my calf. And for a spell, I was editor of a magazine devoted to the club, Rovers World, now sadly defunct. Great read Darren. I remember Alick Jeffrey and I know how well thought of he was in Doncaster. The Ken Richardson story is a belter particularly when he had form with the switching of the race horse sometimes known as Flockton Grey. I heard the commentary from that incredible game at Brentford when I was on my way back from some dispiriting defeat in the Midlands – a great experience for you and not one that I want to repeat in May this year. Should be a decent game. All the best for the future. I can still recall the excitement that Alick Jeffrey created when he made his debut aged 15. Unfortunately I never saw him play, but from everything I have heard, potentially he would have been one of the great players of his era, but for injury. I was however lucky enough to meet and get the autograph of one of the greatest ever Rovers players, the late, great Peter Doherty, who was player- manager in the early 1950’s. This was at Craven Cottage, and a bunch of us made a beeline for him as the Rovers coach arrived. He was utterly charming, and signed all our books, and chatted for about 5 minutes to us kids. He even forecast the score – in answer to one of the Fulham fans, he said that Rovers would win 3-1 – and they did!